With A Golfing Experience, Customer loyalty is rewarded! Earn points on every booking you make. Redeem your points on any future booking or promotion that we will run. Points are non transferrable and only the person for which the booking is booked and confirmed under can redeem the points. You can spend your points at any time on any future bookings but we won't automatically deduct your points. Please tell us that you want to spend your points at the time of booking. Please note that points are valid for a maximum of 3 years. To discuss the latest deals and promotions for your group speak to your A Golfing Experience agent. We believe that both companies compliment each other well with their luxury products and respect to client service. A Golfing Experience has worked in Italy for many years and looks forward to helping UK golfers travel to some of it's finest cities, resorts and golf courses in the lead up to Ryder Cup Italy 2022. Chervò is a prestigious brand of sportswear, designed for the golf-course and dedicated to leisure time. It is designed for customers who love to express their own individuality and lifestyle by wearing innovative and high-quality items of clothing and accessories. Chervò wins with you, with its CHIC-TECH style! Chervò ...Wherever, Whenever. Travel Well ! Play Well ! Look Good ! We hope to offer our group leader customers benefits & better deals on a large range of golf products. Loyalty gifts will be distributed at the discretion of the management. The company was started in 1990 and soon became a strong name in golf retail and is now one of the largest online suppliers of leading branded golf products. All our golf equipment is sold at the lowest UK price guaranteed. With Royal & Awesome, Customer loyalty is rewarded too ! 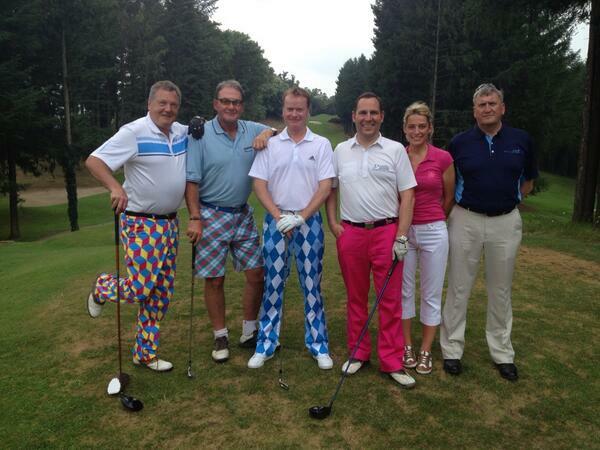 This very successful campaign has now expired but was instrumental in the launch and development of Royal & Awesome products in golf charity events.The customer selected if they preferred shorts or trousers and request the size that they want. The design was selected at random and sent directly to the client. Goods sent out by Royal and Awesome up to 28 days after a deposit has been paid for the entire group. 1 free gift per booking. For the Pars & the Bars ! "As a thank you for your booking your golf travel we are offering exclusive deals and freebies from our spectacular clothing partner Royal & Awesome, that are only available to A Golfing Experience customers .If you're the only one in your group that's brave enough to rock the Awesomes then you can still get 10% off my using the promo codeAWESOMEGOLFHOLIDAY.Please send us your holiday pictures wearing your Royal & Awesomes !! or speak to your A Golfing Experience agent.